Holt for Homes recognizes all you do to make our communities better places to work and live. This is why the Holt for Heroes program offers a rebate or credit of up to $1,500 on the purchase of a home, subject to lender approval. The program also provides discounts on the expenses involved in a home purchase, such as mortgage fees, home inspections, closing costs, and moving expenses through our trusted referral partners. In addition, we have teamed up with local businesses to offer deals like restaurant discounts, dinner theater tickets, and fitness class coupons, all to help get you settled into your new community. For heroes who are selling a home, we offer discounted commissions with our same Holt for Homes services, along with partner discounts. What’s the catch? There isn’t one! You pay nothing to be part of Holt for Heroes. And, while we work with and recommend businesses we know and trust, you are not required to use their services in order to claim your rebate. Our businesses do not pay us to be part of our program and we do not pay them. We choose our businesses because we know they will do a great job for our clients. 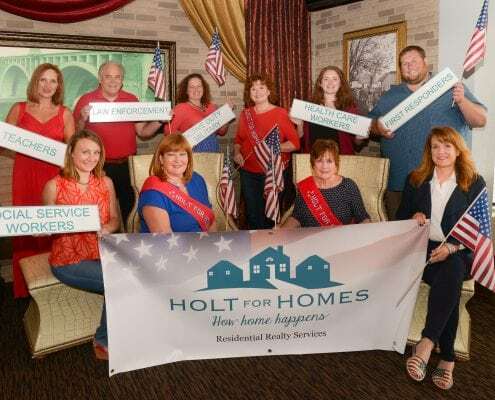 Holt for Heroes is simply a gift to thank you for all you do! Are You a Local Hero? Let’s Discuss our Services!